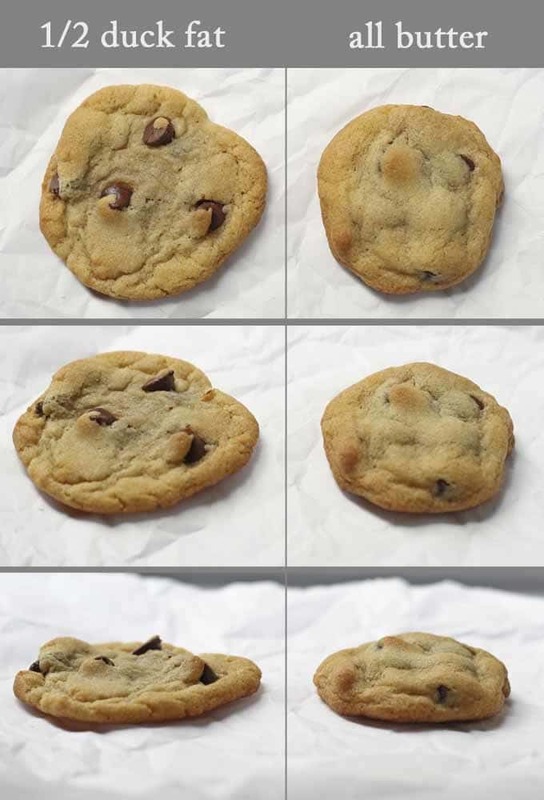 A delightful chocolate chip cookie experiment. 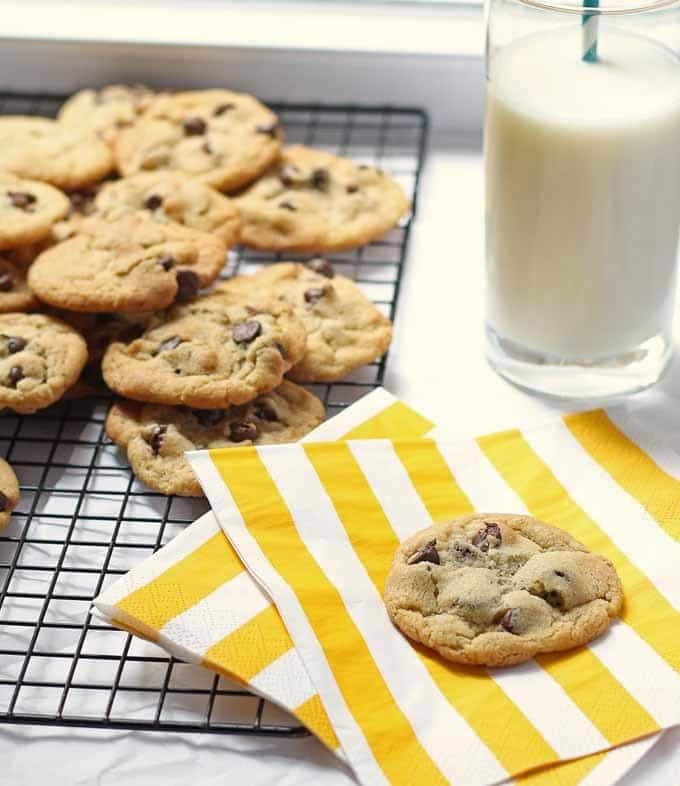 What’s better: chocolate chip cookies or duck fat chocolate chip cookies? I had a little Maple Leaf Farms duck fat leftover after making my cornbread recipe, so I decided to do a little duck fat experiment this week. I put on my apron and oven mitts (the kitchen equivalent to lab coat and goggles) and got to experimenting. Hypothesis: Duck fat chocolate chip cookies taste better than regular chocolate chip cookies. I mixed up 2 batches of chocolate chip cookie dough. They were exactly the same except one batch is half duck fat, half butter and the other batch is all butter. I wrapped up each batch individually in plastic wrap and put it into the refrigerator for 1/2 hour before baking. You can see in the picture above that the duck fat chocolate chip cookies spread out more. They are flatter and the chocolate chips are more visible in the cookie. 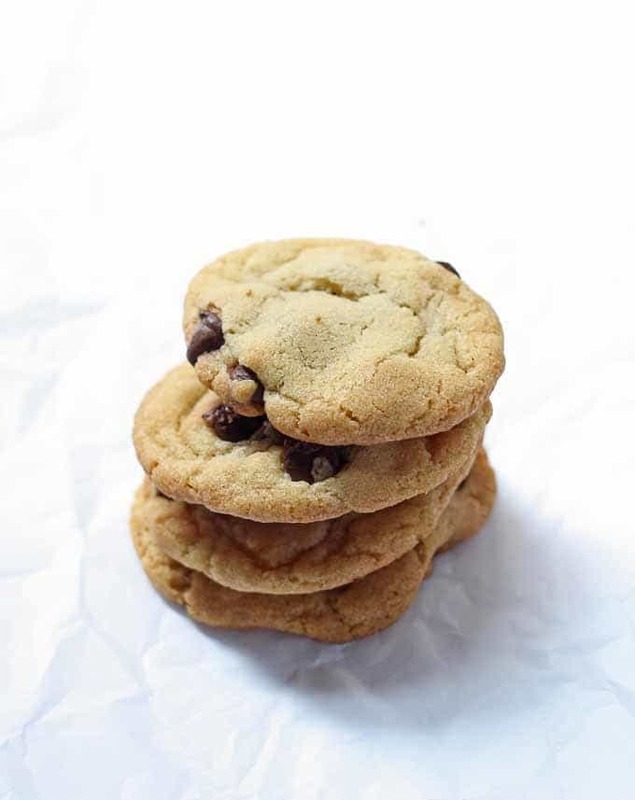 The regular cookies are more compact, thanks to the time in the refrigerator. Taste tests were run and I really like them both. 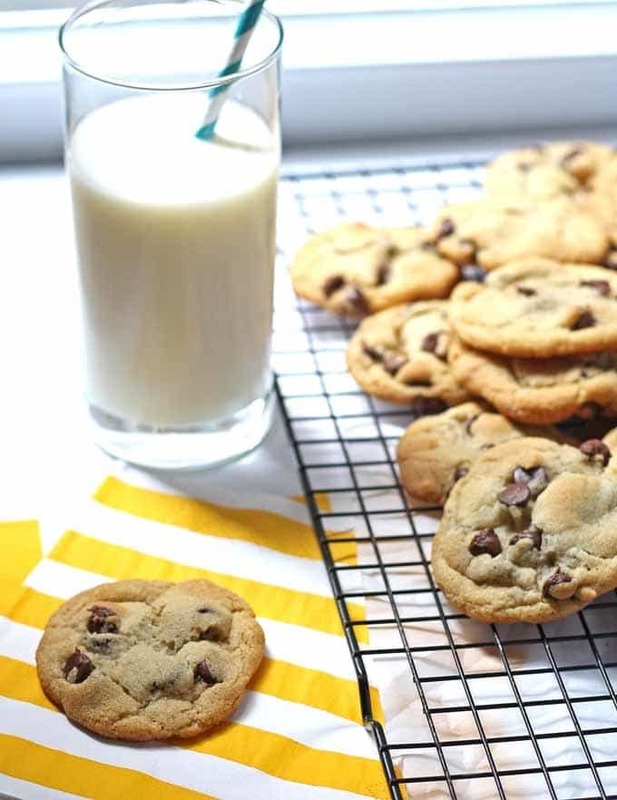 Duck fat chocolate chip cookies are a nice change to a cookie that can sometimes be boring. 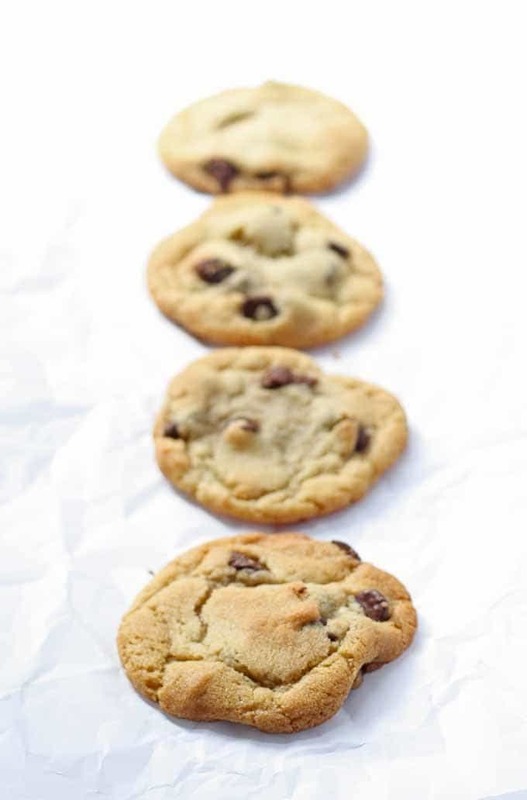 Chocolate chip cookie lovers – please don’t hate me for saying that. But you have to admit that while the same old traditional thing is nice sometimes, it is also safe and boring. Change is good! So the conclusion to my experiment is – duck fat chocolate chip cookies are the best! Mr. B. likes them, so does our neighbor. Mr. B. is bringing them into work today so I won’t know the conclusion to that part of my experiment until later but I have a feeling that my conclusion will hold true. 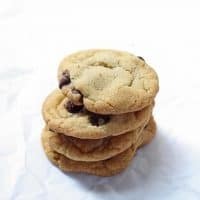 The regular cookies are good too – if you’re looking for a good chocolate chip cookie recipe, this one is pretty darn delicious. You could always substitute the duck fat for butter. Combine the flour, baking soda and salt in a small bowl. Stir with a whisk and set aside. In the bowl of a stand mixer, beat the duck fat, butter, brown sugar and white sugar. When combined add the egg and vanilla extract . Mix until well combined. Beat in the flour mixture until just combined. Turn off the mixer and with a wooden spoon add the chocolate chips. Wrap up the cookie dough in plastic wrap and refrigerate for at least 30 minutes. While that the dough is chilling, preheat the oven to 375 degrees. Line 2 cookie sheets with parchment paper or use cookie sheet liners. Use a tablespoon to drop the cookie dough onto the prepared cookie sheets. Drop them equal distance apart. Bake for 10-12 minutes, until the edges are slightly browned. Transfer to a wire rack to cool. Adapted from The Good Housekeeping Cookbook. I am a brand ambassador for Maple Leaf Farms – they provided me with the duck fat for this recipe. Get your own duck fat here. These cookies sound incredible. Did it have a bit of a savory note to it? I’ve made duck fat caramel before and you can definitely tell there is a little something extra involved. I’ve baked it into cookies and I just love the flavor. It did have a touch of savory! Not a meaty flavor – savory is the right word for it. I never tried duck fat cookies. I gotta try this! Thank you! You’re welcome Marissa, they’re delicious! Okay so I have never heard of duck fat. What does it taste like and can you taste it in the cookies? Jennifer, duck fat is similar to lard. It is the fat from duck meat, rendered. It doesn’t taste like meat at all – it just adds a touch of savory to the cookies. If you’re worried it will taste weird, increase the butter amount and decrease the duck fat amount. You should still get some of the qualities (moist cookies, etc.) just in a lesser amount. 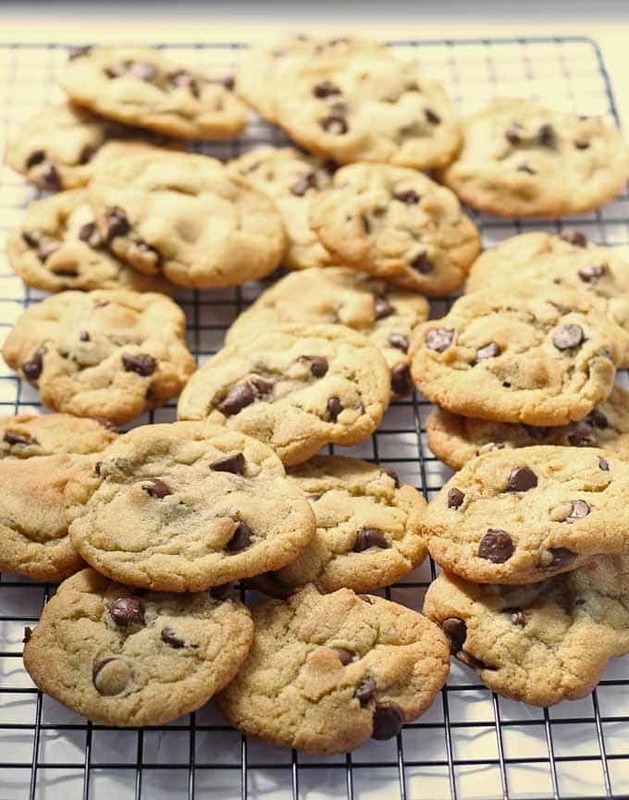 Doubt this will get read on a 2-year old post but having just made chocolate chip cookies with lard to excellent results I was curious to find if anyone had done it with duck fat! These look awesome and I’ve gotta try this myself soon. One bit of wisdom if you ever go with making these again: the dough was likely greasier because, well, there was more grease in it! Butter is 80% fat + 20% liquid, while duck fat is 100% fat. To get a perfect control experiment, try baking with 2 ounces butter (1/4 cup) and 1.6 ounces of duck fat rather than a straight quarter cup of each. The extra spread from the duck fat is likely because of the overall increased fat content of the cookies. They’ll come out similar in appearance, but then you’ll really get to compare the flavors! Thanks Danny! I will try out your ratio the next time I make this recipe.